Free Delivery to West Orange! 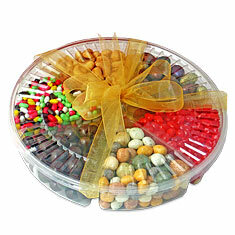 Just in time for the Chagim - a six-section covered lucite candy wheel filled with dark chocolate covered pretzel balls, candy coated fruit and nut "rocks", almond jewels, candy coated licorice, cashews and Jelly Belly pomegranate jelly beans - yum! Ground: $7.95 Free to West Orange!